Soft,spongy and melt in mouth Gulab jamuns wet thoroughly in delicately flavoured sugar syrup is a traditional sweet in india , without Gulab jamuns every Indian party or wedding is incomplete.There are so many ready-made instant mixes available in market but no one comes even close with the taste of home made tasty and hygienic Gulab jamuns made with khoya/Mawa.You can enjoy these any time, in summers with ice cream, in winters really hot Everyone loves these sugar syrup immersed Golden Brown Beauties People prepare it in many ways, with Mawa, milk powder and even bread But the traditional way to make them is with Khoya/Mawa Khoya is basically a dry evaporated milk solid .This recipe also stress away from artificial colour and rose flavoured sugar syrup for more rich and delighted saffron flavoured syrup.This recipe is perfect homemade Gulab Jamun recipe So lets make our Mawa Gulab Jamun. Step 1: we make sugar syrup first,add in sugar and water in a pan switch on the flame and stir continuously till the sugar melts now we'll add lemon juice so the sugar doesn't form crystals some cardamom powder too and now rose water Its not a Gulab Jamun unless you put "Gulab Water" or Rose water in it! we'll let it boil till it forms a 1 sring sugar syrup now that the sugar syrup is ready.it take 15 to 20 minutes. Step 2: Making Jamuns,Prepare 1 cup of mawa by following the recipe given above or use ready made mawa.Crumble it using hand or grate it using a grater.Add 1/8 teaspoon baking powder and 1/2 sifted maida,Mix it gently with spoon. Step 3:After that,knead all of them together until smooth dough is prepared.if required add add few teaspoons of milk to knead a soft dough.Don't add more milk then required,add one teaspoon at a time until smooth consistency of dough is achived. Step 4: Divided dough into small equal parts 16 to 18, grease hand with ghee and make smooth surfaced balls from it. Make sure balls prepare with carefully we don't get cracks while frying.If cracks comes then add again milk in dough,mash it together than make smooth dough and make balls again without crack.Do not make very large balls because they will increase size while frying and deep soaking in syrup. Step 5:Heat the oil for frying Its very important that you fry on low or medium heat if you fry on high flame, the gulab jamun will appear cooked from the outside only but from inside they'll be left.Deep frying until they turn into golden brown.it will take around approx.10 minutes.cooking them evenly is the Key to soft and textured Julab jamuns increase or decrease flame intensity to keep the ghee temperature even while frying. Step 6:Put them on a kitchen towel or tissue paper to remove excess oil leave it for 4-5 minutes.when balls cool down do not add them directly into warm sugar syrup. Step 7: After that add balls in little warm sugar syrup (not hot check before add ball into syrup)if you add into hot syrup they will shrink in size. Step 8: Cover it up for half an hour so that the Gulab jamun get immersed in the sugar syrup I know after so much hard work, its a little difficult to be patient. 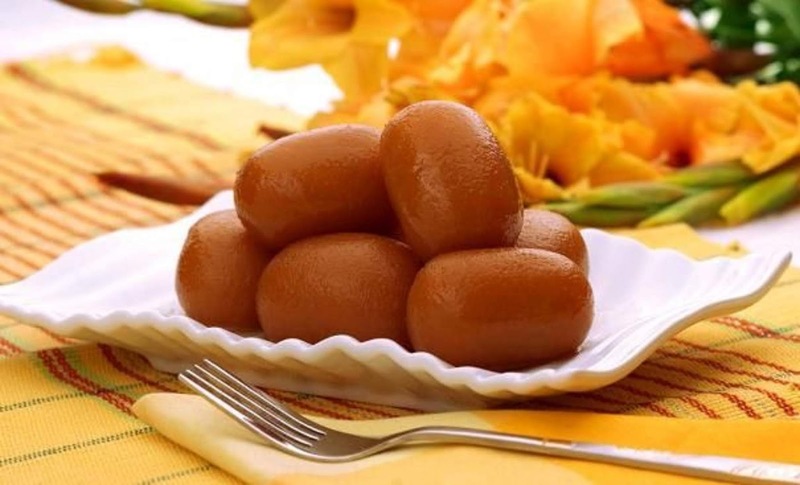 Finally : The most tasty homemade Gulab jamun is ready to serves.